We spend a lot of our time in apps that either accept our typing, like Evernote. 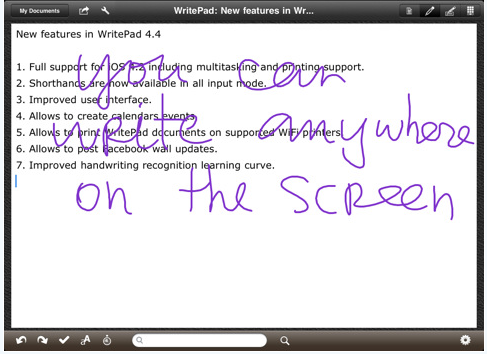 And apps like NoteTaker that leaves our handwriting as ‘electronic ink’. One app that is getting used by more and more of the team is WritePad (the iPad version). The developers keep tuning their handwriting recognizion engine in every update. We wont go down the path of this being a big Newton… this is an app not the core iOS. WritePad has two key items covered that is important for handwriting recognition engines… they must learn with the writer so it isn’t up to one side to be the only one changing to make things work. And, it has to allow for quick text changes for words it gets wrong. There has been a few handhelds over the years that would accept handwriting but it took so long to fix what it got wrong it would take minutes to get a sentence down. The bigger screen of the iPad over other ‘handhelds’ helps a lot too. 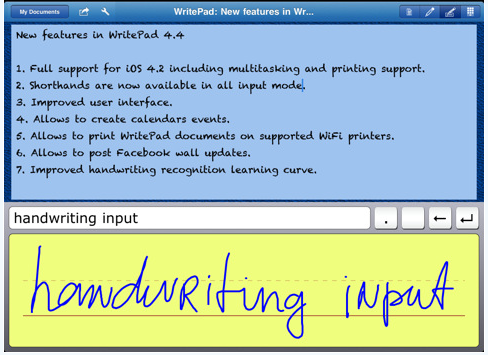 WritePad allows for full screen handwriting that converts to text as well has the ability for a handwriting box that allows to correct converted text prior to freezing to the page. 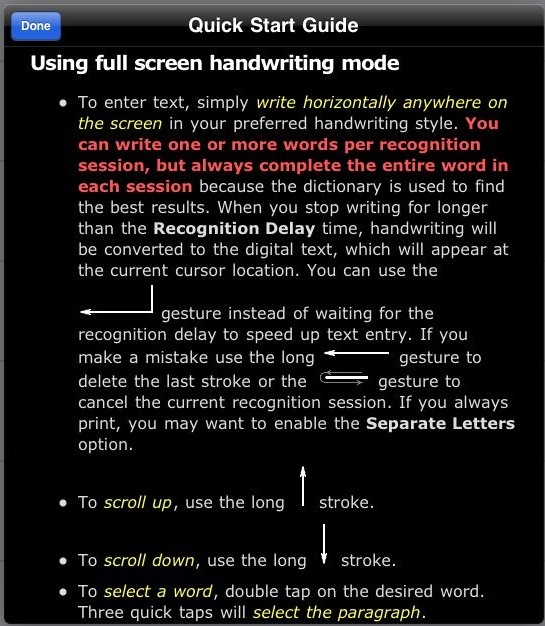 While we use a variety of styluses (one we mentioned from Griffin), the app does a good job of understanding handwriting done with a fingertip. Shorthand entry has been supported for several versions. 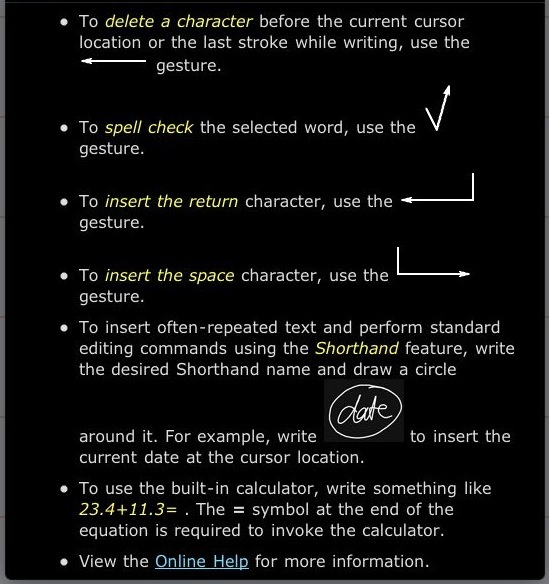 This update allows shorthand to be used when handwriting the original text. 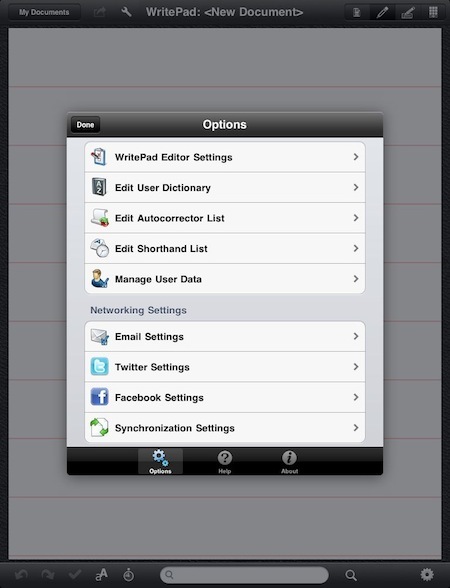 Just a matter of circling a group of letters for WritePad to know it to handled as a quick entry for extended text. The Options area has been expanded (Gear icon in lower right corner of all screens) to include Theme Color and Facebook posting. Twitter, emailing and DropBox syncing is still available to customize as you need. We shouldn’t need to remind you of the importance of the DropBox sync so you don’t loose your WritePad notes if you have an issue with syncing to your desktop in the future.